Sometimes, when you decide to take advantage of Windows Troubleshooter to fix Windows update error, your computer stumbles upon potential Windows Update Database error detected on Windows 10. Or in the process if updating Windows 10, it is also possible for you to run into this Windows Update component must be repaired. With regard to the reasons for this potential Windows Update Database error detected comes to you, the corrupted system files, Windows Update service, and system issues are to blame. On the occasion where you have already grasped the causes of this Windows update issue, it is high time that you tried to solve this problem on Windows 10. 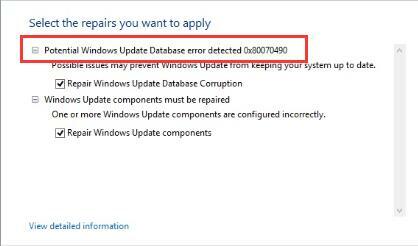 How to Fix Potential Windows Update Database Error Detected Windows 10? It is said that when you are unable to enter the C:\WINDOWS folder, the Windows update error can come to you with unknown reasons. You may as well try these ways below to deal with this Windows update repair issue. As you have been reminded, this potential Windows Update Database error detected in some sense can be caused by file corruption related to Windows Update, thus, you need to perform SFC (System File Checker) to remove the corrupted files. 2. Then in Command Prompt, enter sfc/scannow and then hit the Enter key to run SFC. 3. You can obviously see the SFC begins scanning the files. Ever since you corrected the corrupted system files for Windows 10, it is likely that the Windows Update error can be fixed as well. 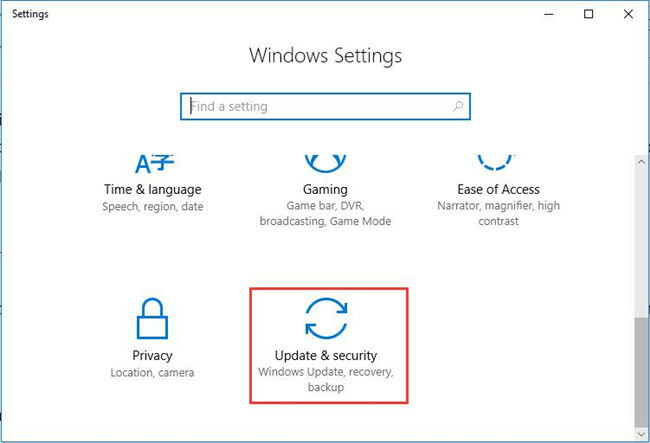 Now that it is a Windows Update issue, there is much need for you to get deeper to make use of the troubleshooter for Windows update. Perhaps this tool is capable of resolving the problem simply. 2. 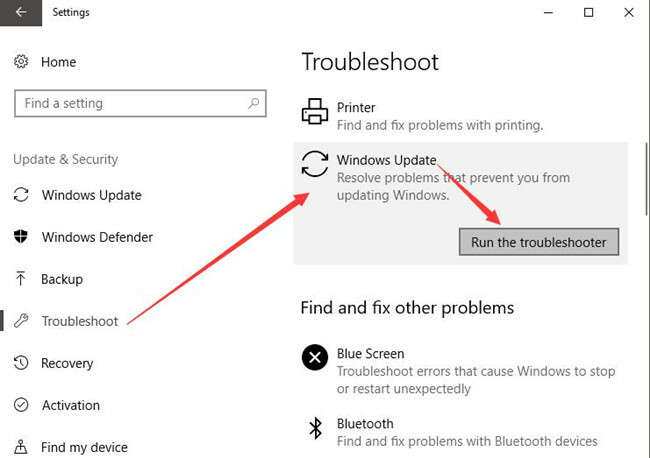 Under Troubleshoot, locate Windows update and then hit Run the troubleshooter. Once the troubleshooter begins the detecting, maybe the potential Windows Update database error can also be figured out and corrected. Besides the file corruption, the service of Windows Update is also one of the culprits. In this way, you would better make up your mind to restart the Windows Update service to deal with potential Windows Update Database error detected Windows 10. You are able to accomplish that in Command Prompt. 1. Step 1: In Command Prompt, enter the following commands to end Windows Update service. You can see Windows Update service is stopped from Command Prompt. 2. 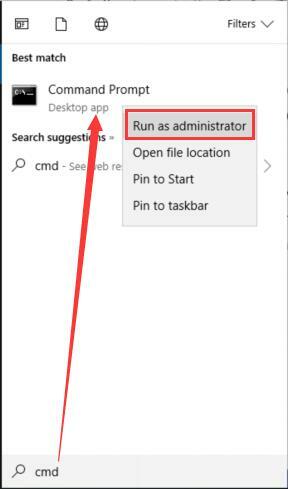 Then decide to rename the folders in Windows 10 with the commands below. There is no need to rename them in File Explorer. 3. 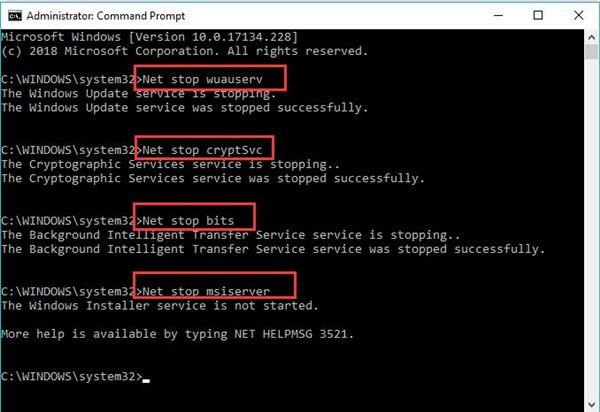 After that, use the following commands to restart the Windows Update service in Command Prompt. Close Command Prompt and then go back to Check for Updates in Windows 10 to see if it works properly without meeting with potential Windows Update Database error detected. If you renamed the files for Windows 10, but find nothing happened and the Windows update error has not been resolved, you can also choose to delete the files for these software files. To some extent, these problematic files could give rise to a potential error detected for Windows Update. 1. Double click This PC to open this system program. 2. Then in File Explorer, navigate to C:\Windows\SoftwareDistribution\Download. 3. Then go into this Download folder and then right click the files in it to Delete them all. Then restart Windows 10 to take effect. 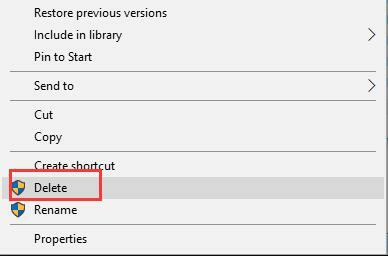 Now without the erroneous files, you can check whether or not the error relevant to Windows update is removed from Windows 10. In a word, in order to tackle potential Windows Update Database error detected 0x80070490, you can also make minds to do a clean boot for Windows 10. Then it is predictable that the Windows Update error detected disappeared. This article very helpful to all.